Cube a day-old baguette or other crusty bread, and put it into a lightly-oiled deep casserole dish. Stir in a mixture of vegetables: I used sautéed mushrooms, sliced red peppers, onions and spinach. You can add cooked meat of your choice, if desired. Sprinkle on dried herbs, such as basil, oregano or thyme. In a separate bowl, whisk together 4-6 eggs (take a couple of yolks out if you like, to reduce cholesterol) with two cups of milk. Pour this mixture over the casserole ingredients. Photo taken from ‘Cook with Jamie’; photography by David Loftus and Chris Terry. Sweat the leeks, thyme and garlic with a splash of olive oil and the butter in a heavy-bottomed saucepan on a low heat for 20 minutes until they are soft and sweet. Turn up the heat and add the white wine. Let the wine come to the boil, then add the beans and a splash of water, so that the beans are almost covered. Allow to simmer gently for 5 to 10 minutes until the beans are lovely and creamy. Add the parsley, creme fraiche and a good glut of extra-virgin olive oil and taste for seasoning. Heat a griddle pan until white hot, season your steaks and pat with olive oil. Grill a 1-1/2 inch thick steak for 2 to 3 minutes on each side for medium-rare. You can keep them on there for longer, turning as you go, until cooked to your liking. Remove from the grill on to a dish and rest for 5 minutes. Squeeze over some lemon juice and drizzle over some extra-virgin olive oil. Carve the steaks into thick slices. 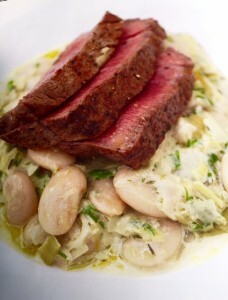 Divide the creamy beans between your plates and place the steak on top, drizzling over some of the resting juices. Slice 4-6 potatoes thinly. 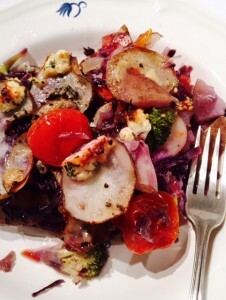 Layer them with other sliced vegetables–I used purple cabbage, carrots, cherry tomatoes, onions and broccoli. Press into a casserole dish, top with any cheese you might have in the fridge (I used blue and goat’s), pour in one or two cups of broth and bake, uncovered, for about 1 hour at 350 degrees. My good friend Brenda Hawkins brought this appetizer to a gathering of a few longtime girlfriends–friendships we’ve had since high school. Brenda is the Appetizer Ace of the group, and always brings something delicious, healthy and beautiful to look at. I’m making it today to bring to my parents’ home, where our extended family will gather for Christmas. I’m not sure where Brenda got this recipe originally, but here it is. Enjoy! Refrigerate this mixture for about 4 hours, to allow the flavours to mingle and the sugar to dissolve fully. 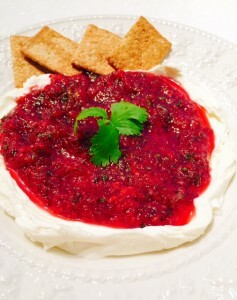 When ready to serve, spread light cream cheese on a serving plate. Top with the cranberry mixture. Serve with whole-grain or seedy crackers. I like Kashi Original 7 Grain, or Mary’s Original Organic Seed Crackers. I recently found myself with a bag of Ontario McIntosh apples that I didn’t think my husband and I would be able to finish before they “went off.” So I looked into the trusty Better Homes and Gardens New Cookbook that my mom gave me years ago and found a recipe for Apple Cake. 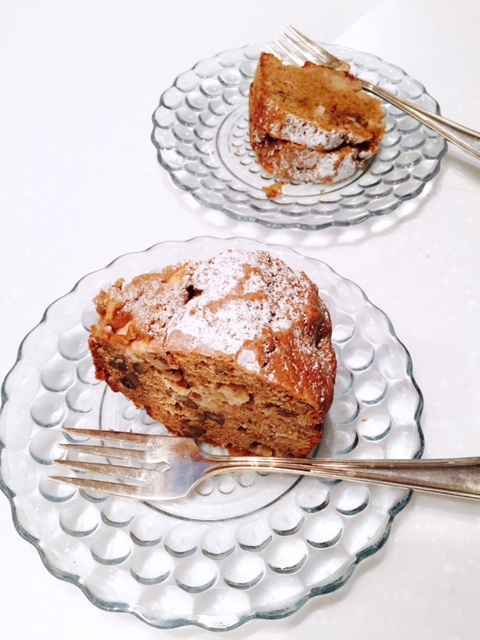 It was a hit with me, with Jules and with friends who tried a slice–and a tasty way to get real fruit and fibre, admittedly along with fat and sugar. 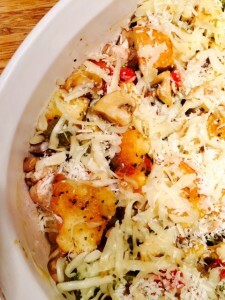 In fact, my good friend Katrina (who built this website) loved it so much she urged me to share the recipe. So, here it is–with absolutely nothing modified! 1. Grease and lightly flour a 10-inch tube pan; set aside. Stir together flour, baking powder and soda, spices and a 1/4 tsp salt. Set aside. 2. In a mixing bowl, combine sugars, oil, eggs and vanilla. Beat with an electric mixer on medium for 2 minutes. Add dry mixture and beat on low just until combined. Batter will be thick. Fold in apples, nuts and lemon peel. Transfer batter to prepared pan and press in evenly. 3. Bake at 350 degrees about 1 hour, or until a toothpick inserted in centre comes out clean. Cool cake on a wire rack for 10 minutes, then remove from pan and cool thoroughly on a wire rack. Sprinkle on powdered sugar. This is so good that I’ve had it for lunch twice in one week. Simple! Wash a large handful baby spinach leaves and place on a non-stick frying pan (no need to add any oil, though). Add 3 or 4 seeded, sliced cherry tomatoes. Heat vegetables until spinach shrinks. Crack one egg slowly overtop (if you want to cut down on the cholesterol, use just the white). The egg will spread on the pan but as it cooks and whitens, use a spatula to scrape egg back on top of the veggies. As omelette cooks, pop an English muffin into the toaster. Flip omelette; cook about another minute. 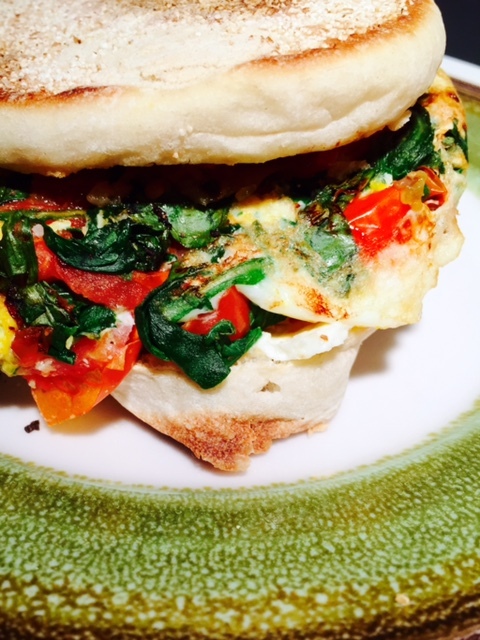 When muffin is toasted, add feta cheese to bottom layer; lay omelette on top. Add whatever sauce you fancy–I use La Bamba, a spicy Italian condiment I can’t get enough of. Enjoy! Here’s a Jamie Oliver recipe that I adapted to the North. On my trip to a native community called Webequie, in the far northwest of Ontario, I helped Stratford, Ont., chef/schoolteacher Paul Finkelstein on his quest to make kids better cooks. He brought along students from his own school and invited some of the local students in Webequie to join us for some starter cooking tips. We focused on simple tips and recipes, so I brought along Cook With Jamie, one of Oliver’s excellent cookbooks; it focuses on some basic but delicious recipes to help get more people in the kitchen and out of the fast-food lineups. It aligns exactly with Finkelstein’s philosophy. To the many recipes Paul created with the kids, we added one based on an Oliver recipe. 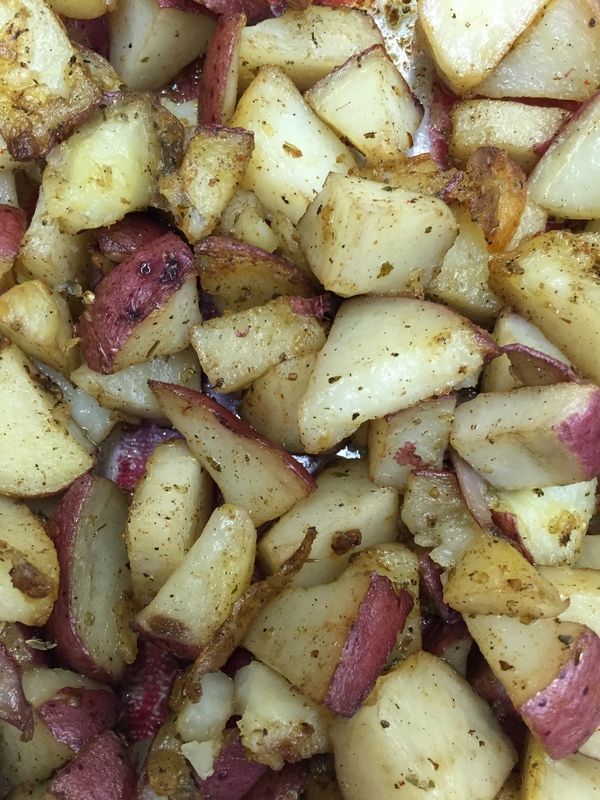 There isn’t a large variety of foods available in the Northern Store in Webequie, but there are potatoes, so we adapted Jamie’s “Rosemary-Roasted Cubed Potatoes” recipe to fit the ingredients that we had. Oliver’s recipe calls for rosemary but we made due with mixed dried herbs that we found a jar of in the kitchen cupboard at the six-room motel where we were staying. It also calls for garlic, but we used an onion instead. Once the kids tasted the potatoes, they wondered why you’d buy an expensive bag of the pre-made, frozen, oven variety. -Peel or scrub about 1 lb. of potatoes, and cut into cubes of approximately 2 cm square. -Finely dice an onion. Toss it, with the potatoes, into a large bowl with a few glugs of olive oil, about a teaspoon of dried herbs and a little salt and pepper. Stir well, enough to coat potatoes. -Roast on a baking sheet in a 425-degree oven for about 40 minutes. Two or three times during the roasting, remove tray from oven to stir and scrape up potatoes with a spatula. The potatoes are ready when they’re golden and crispy.